Aluminum fencing is a common option for many fence applications but what are its benefits? The following is a list reasons why aluminum fencing is a perfect choice for your next fencing project. 1. Cost. Aluminum fencing costs much less than traditional wrought iron. True wrought iron fencing must be fabricated in our shop with more expensive metal as compared to aluminum fences that are manufactured. 2. No Rust. Aluminum does not rust like iron, which is classified as a ferric metal which will oxidize and rust. Aluminum is not a ferric metal and will not rust. It’s estimated that aluminum can will take over 10,000 years to disintegrate. 3. Low Maintenance. Unlike wrought iron fencing, aluminum will not need to be painted every few years. When manufactured, our aluminum fencing receives multiple protective coats including a powder paint coating that will last without needing to be repainted. 4. Esthetics. 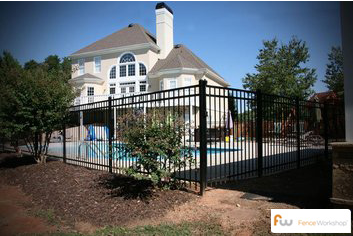 Aluminum fencing provides low maintenance containment and security while looking great. Black metal fencing blends with almost all landscapes and is available in a variety of styles. 5. Security. Wood fences can easily be scaled and chain link fences can easily be cut while aluminum fencing with spear-topped pickets is a much harder fence to breach. 6. Rakablity. Most good aluminum fence panels are rackable meaning they can adjust to the slope of your land. If your fence is not rakable, then it can and will leave unsightly gaps at the bottom of the fence when going up or down a grade. 7. Warranty. Our aluminum fences come with a lifetime manufactures warranty. At Fence Workshop™, we’re leading suppliers of aluminum fences and gates in Georgia, Florida and North Carolina. We supply aluminum fencing from multiple aluminum fence manufacturers and provide both residential and commercial aluminum fence materials and supplies.